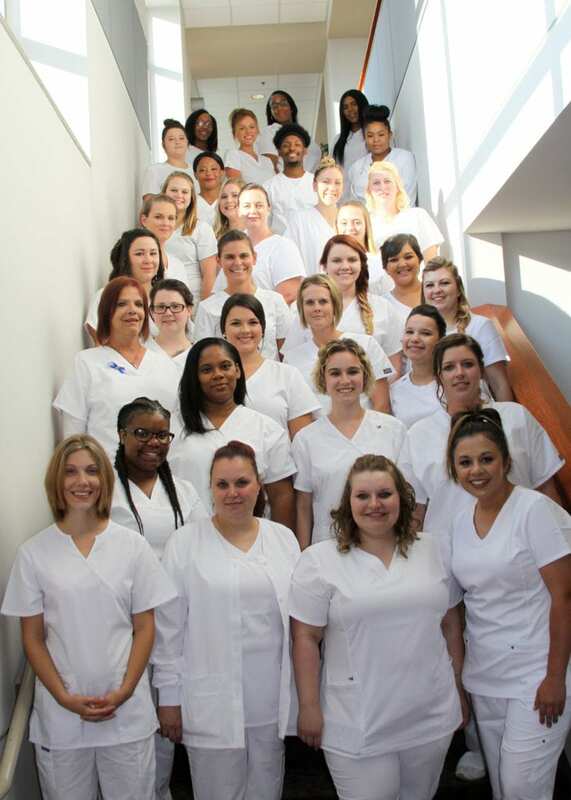 The sixth annual pinning and graduation ceremony honoring the students of the Hannibal-Lagrange University Practical Nursing Program was held on August 9, 2018 at the Roland Fine Arts Center on the University campus. A class of 34 students received their pins after a 52-week course of study in the program. The HLGU-PN Program was established in 1961 and was sponsored by the Hannibal Public School System until its relocation and change of sponsorship to HLGU in August 2012. This graduating class represents the fifty-fifth for this program. Those honored were: Belinda Abbey, Sha’Tya Bias, Stacey Buss, EmmaLee Butler, Ashley Tutt, Shelby Grimsley, Natalia Johnson, Mariah Liggett, Alyssa Miller, Mariah Milsap, Jami Stupavsky, Kayla Vaughn, Krista White, and Angela Zenk of Quincy, IL; Jazmin Adams and Nicole Woods of Monroe City, MO; Summer Adams, Abigayle Dodd, Kimberly Santos, Danielle Shrum, Charity Stevens, and Staysha Sydnor of Hannibal, MO; Betsie Betts of Bowling Green, MO; Malik Pulline of St. Louis, MO; Angela Boudreaux and Heather Knobloch of Shelbina, MO; Leslie Carter of LaGrange, MO; Kendra Hays of Vandalia, MO; Shatarria Knight of Beloit, WI; Jamie Overby of Kalamazoo, MI; Tiffany Radcliffe of Frankfort, IL; Britney Sidwell of New London, MO; Sarah Spurgeon of Palmyra, MO; and Rebekah Walsh of Pittsfield, IL. Recipients of special awards were: Angela Zenk, General Nursing Proficiency Award; Jazmin Adams, Clinical Nursing Award; Rebekah Walsh, Brandie Kearns Memorial Nursing Personality Award; Betsie Betts, Stacey Buss, and Mariah Liggett, Beth Haven Community LPN Scholarship; and Ashley Tutt received the Hannibal Clinic Award. Scholastic Achievement Awards were presented to the top 20% of the class and were received by: Betsie Betts, Valedictorian; Stacey Buss, Salutatorian; and Mariah Liggett, Summer Adams, Kimberly Santos, Angela Zenk, and Krista White. Stacey Buss was recognized with the Perfect Attendance Award. Awards were made possible by the Northeast Missouri Medical Society, Hannibal Regional Hospital, the family and friends of Brandie Kearns, Mennonite Home Association, Hannibal Clinic, Maple Lawn Nursing Home, and the HLGU-PN Class of 2017. The guest speaker for the evening was Kim Bouyea, MSN, RN-BC, clinical educator, coordinator of nursing development, and interim director of the medical-surgical unit at Hannibal Regional Healthcare System. Special music for the ceremony was presented by the Hannibal Regional Heartbeats. The Hannibal-LaGrange University Practical Nursing Program is a fifty-two week certificate program located on the University campus. Classes start each year in late August. The program is affiliated with Beth Haven Nursing Home, Hannibal Clinic, Hannibal Regional Hospital and Medical Group, James E. Cary Cancer Center, Maple Lawn Nursing Home, Marion County Health Department, Mark Twain Behavioral Health, NECAC Family Planning, Ralls County Health Department, and Turning Point Recovery Centers.